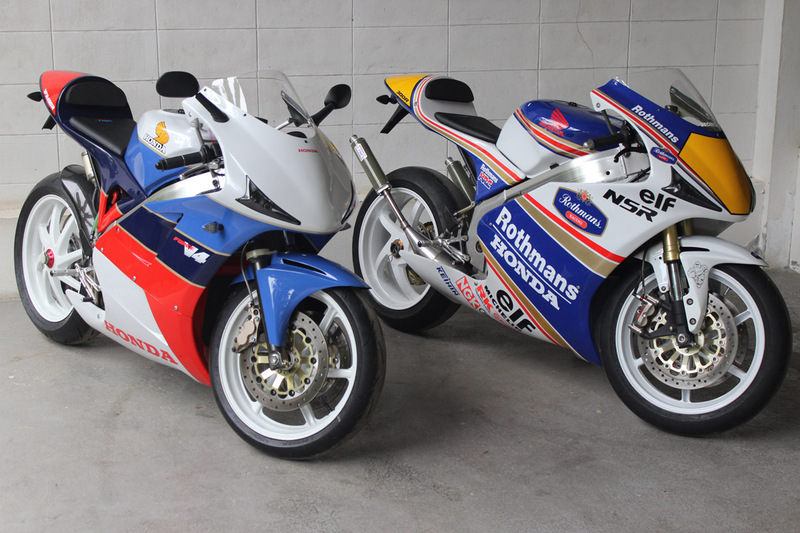 It is 30 years ago since the iconic RC30 was launched and took the racing world by storm. 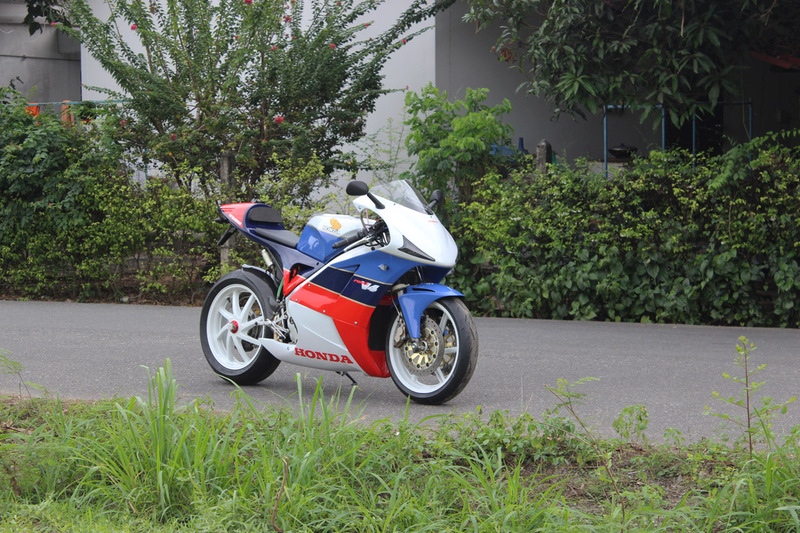 The street bike was really a race bike in disguise and took very little effort to get it to race winning spec. 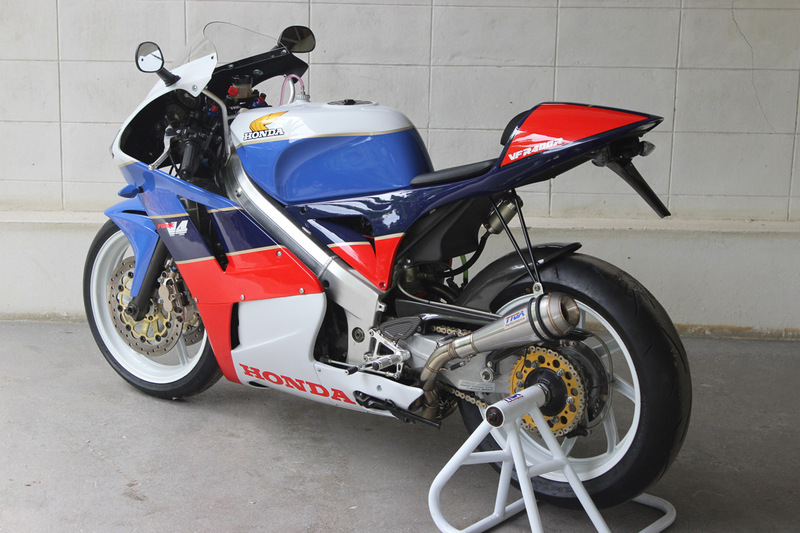 It went on to win the WSB, Isle of Man and numerous short circuit and Endurance races and championships. 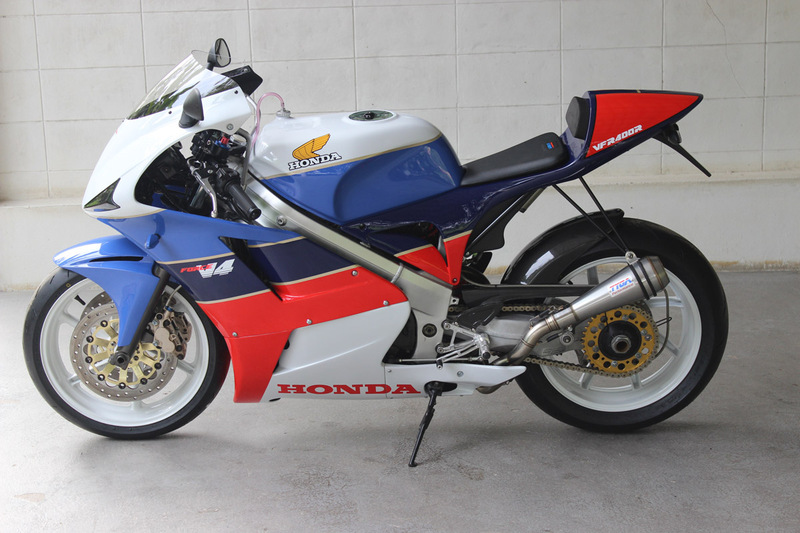 It is hard to think of another bike which had so much impact and success in racing in modern times. 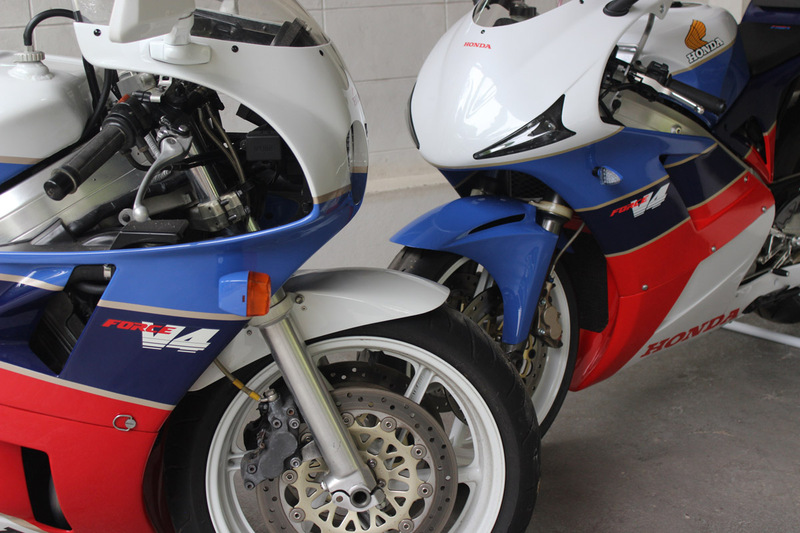 Looking at photos and video footage of the time, there were many RC30s raced in the stock iconic white/red/light blue/dark blue scheme which was also the factory race colours of the late 1980s on both the RVF750 and RVF400 Suzuka 8 hour race bikes. 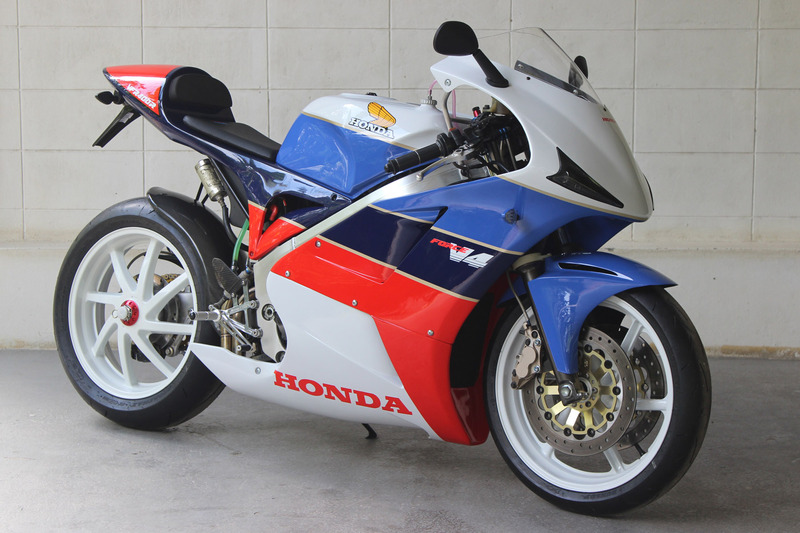 An adaptation of this scheme has been used more recently on modern Hondas such as the CBR1000RR and has become known as the ‘TT Legends’ . 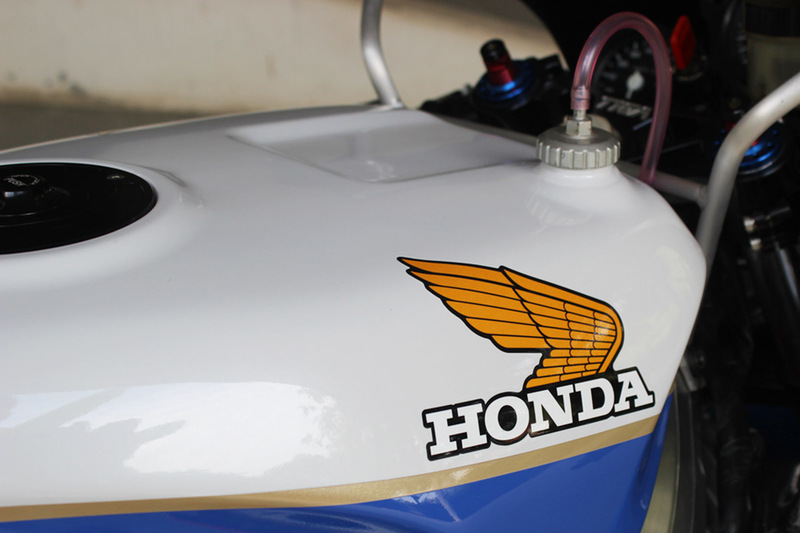 Personally, I think it looks correct when applied to a Honda V4 but I can see the temptation for Honda to remind us of his earlier racing successes by applying it to their more modern and conventional production racers. Anyway, it was an obvious choice for our latest project bike. 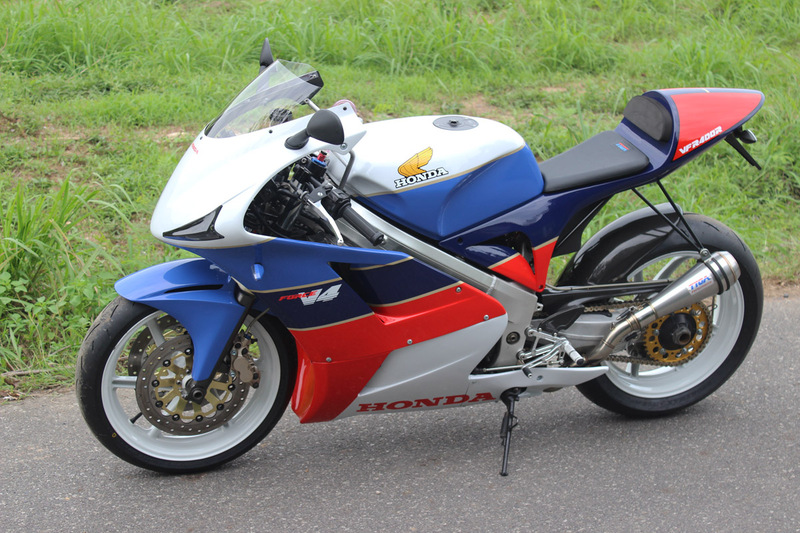 Going back to the 1980s, as well as the RC30, there was of course the NC30, launched as an 1989 model, a kind of a ‘mini-me’ version of the RC30 in 400cc form. 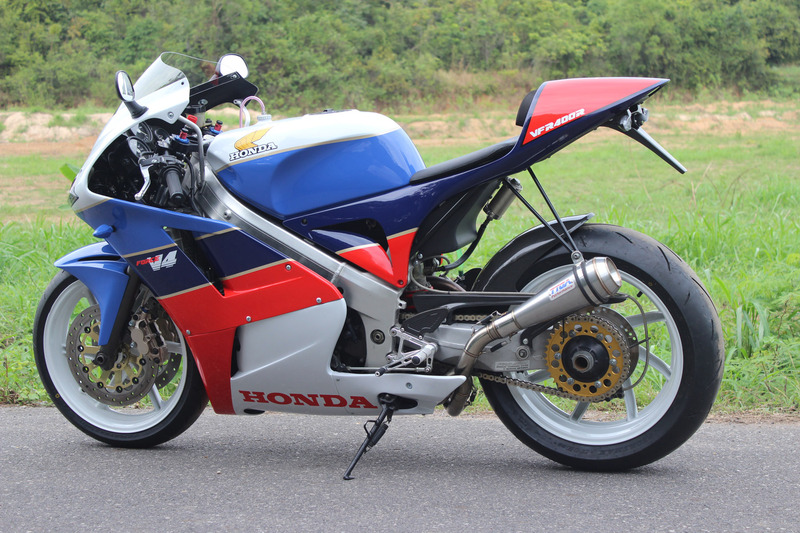 It had the same V4 configuration in a similar chassis with Pro Arm rear and was styled to leave no doubt that this was the RC30s little brother. 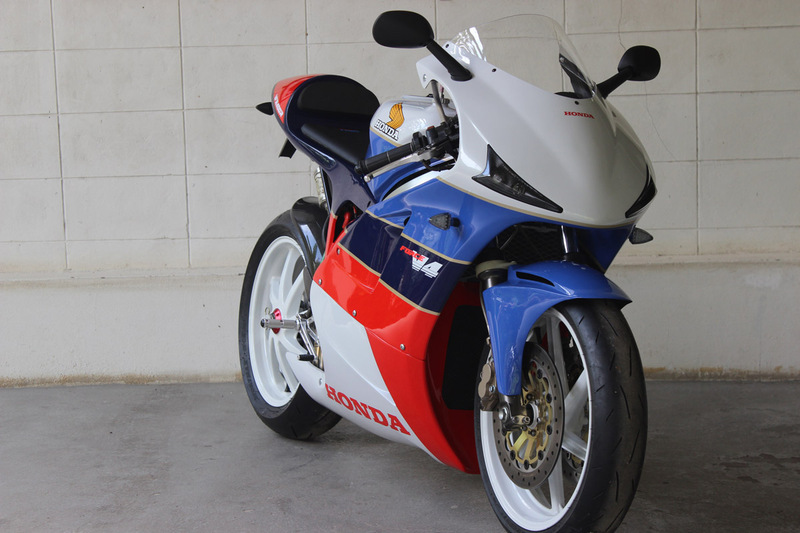 Again, it achieved racing success and, unlike the RC30, it was main stream model, and found its way to every corner of the globe as either an official model or more often as a grey import. 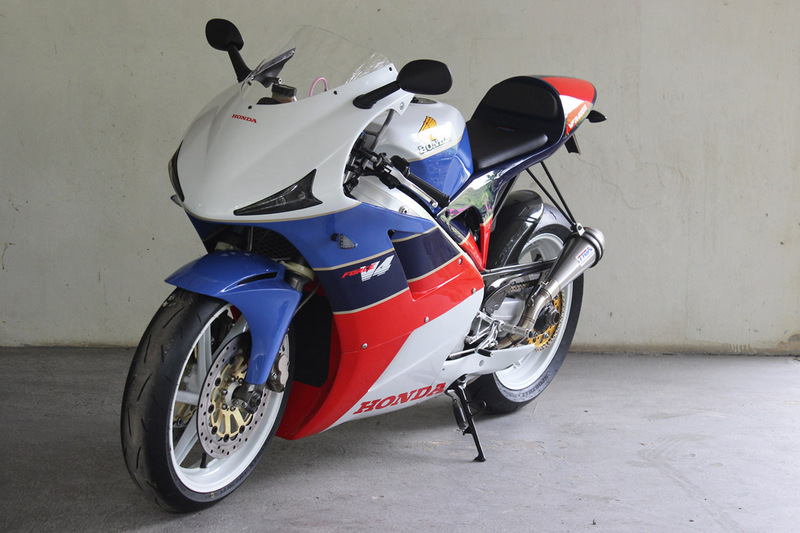 Even though it was mass produced and sold at a fraction of the cost of the 750, the engineering and quality of the model was not compromised and as a result, there are thousands of loyal and enthusiastic owners around the world today who ride, restore, modify and race their NC30s. 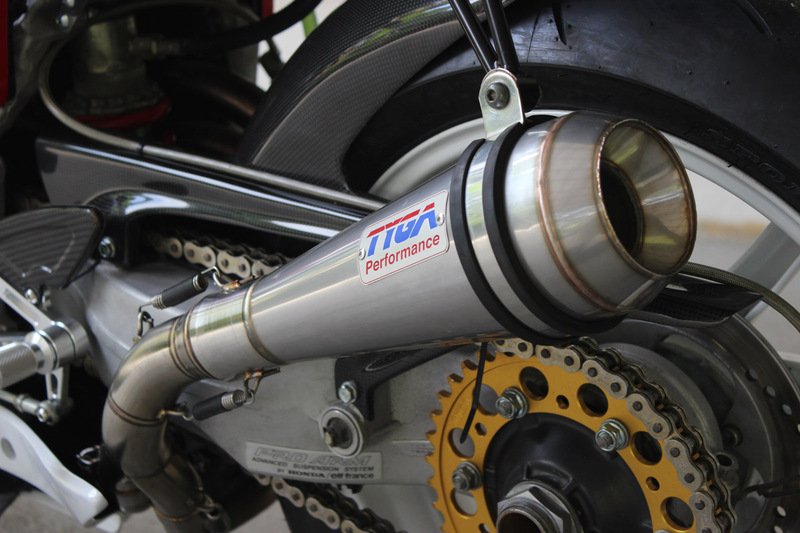 For the last 17 years, TYGA Performance has been supporting older model sports bikes from this period and the NC30 has always been a core model for us. 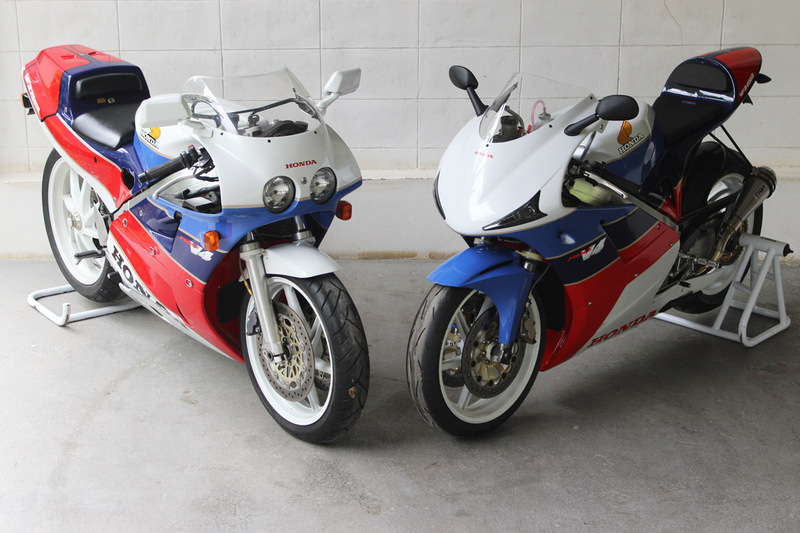 During this period, we have developed various products specifically for the NC30 and built several project bikes which can be viewed on this site. 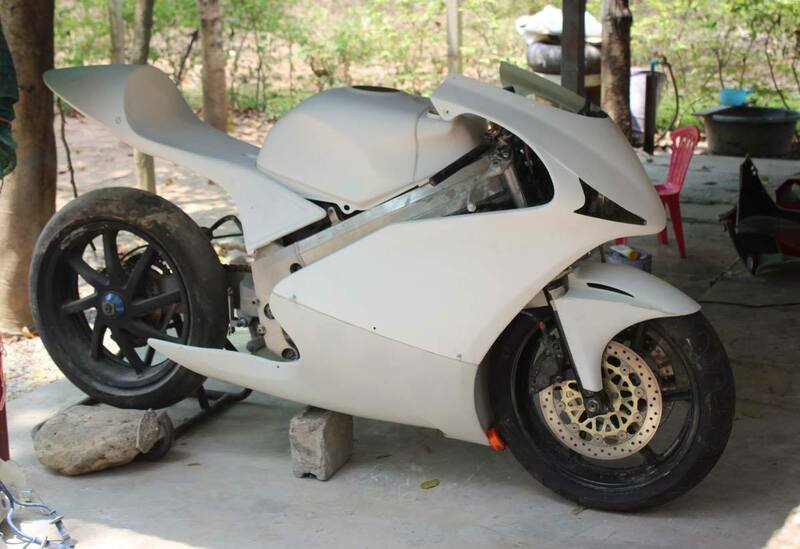 It has been a few years since the last TYGA NC30 project, and with the launch of our latest GP-T bodywork, it was high time we made another one. The GP-T kit utilizes LED lighting technology front and rear. 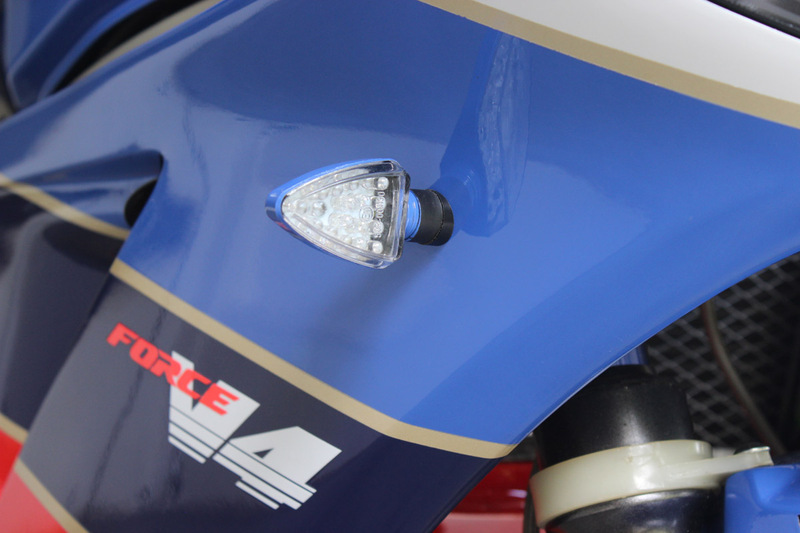 The front consists of 4 LEDs arranged with 2 for dip and all 4 for high beam. The beam is bright even though the headlight units are inconspicuous. 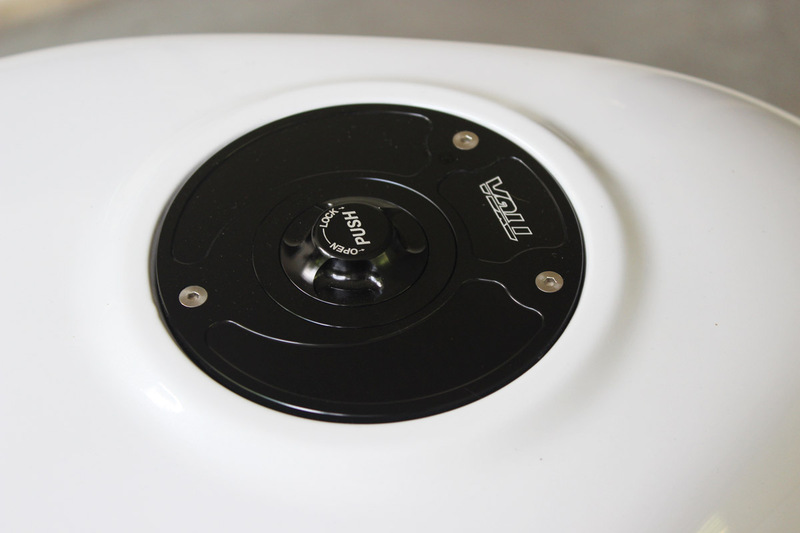 They are all designed and assembled in-house at TYGA and as such may not comply with regulations so we should warn potential buyers of that, though we have not heard anything negative back from NSR owners who have been using their GP-T kits for 18 months or more now. 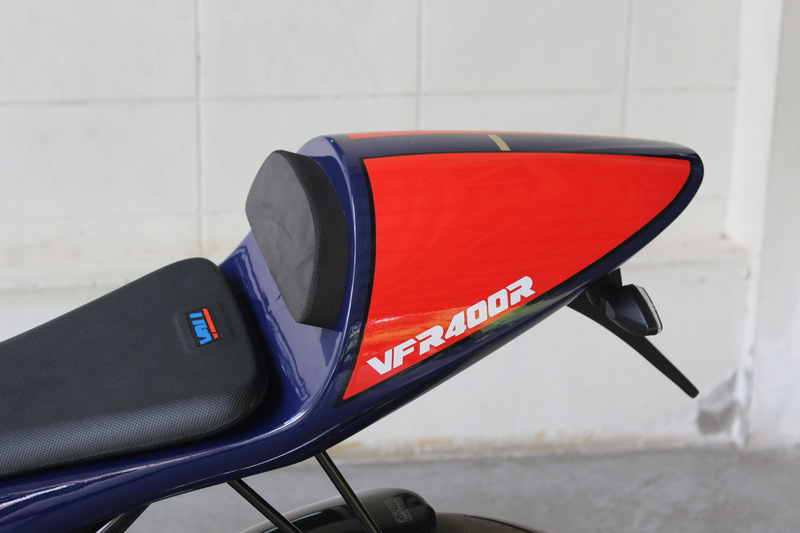 The tail end uses the familiar LED taillight we have supplied with many of our kits. Turn signals are also LED, so modern flasher relay is necessary to allow everything to operate smoothly. However, because of the weird wiring harness on the NC30 and some other Hondas of the time, a special mini harness with the required electrical wizardry is plugged into the lighting harness at the front end to allow the turn signals to work as well as the indicator light on the instrument cluster. All plug and play! 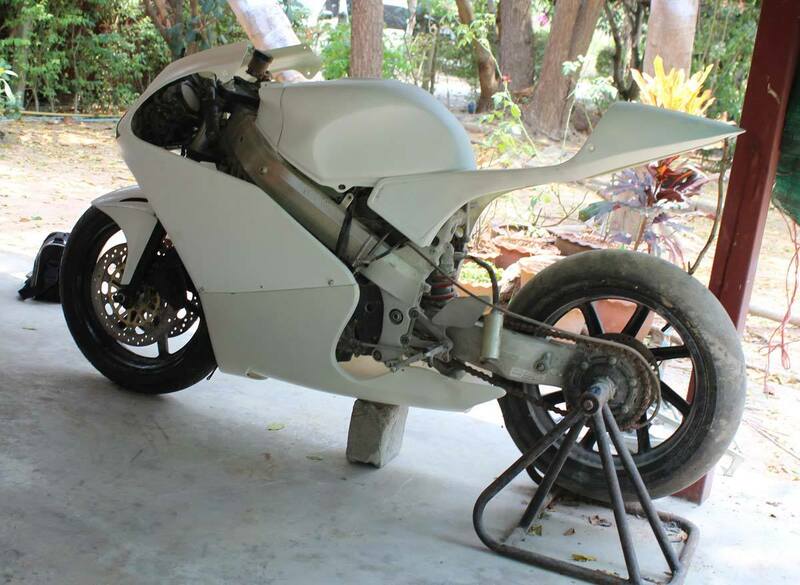 Electrical power is supplied via a Shorai Lithium battery which saves around 1.5 kg of weight. 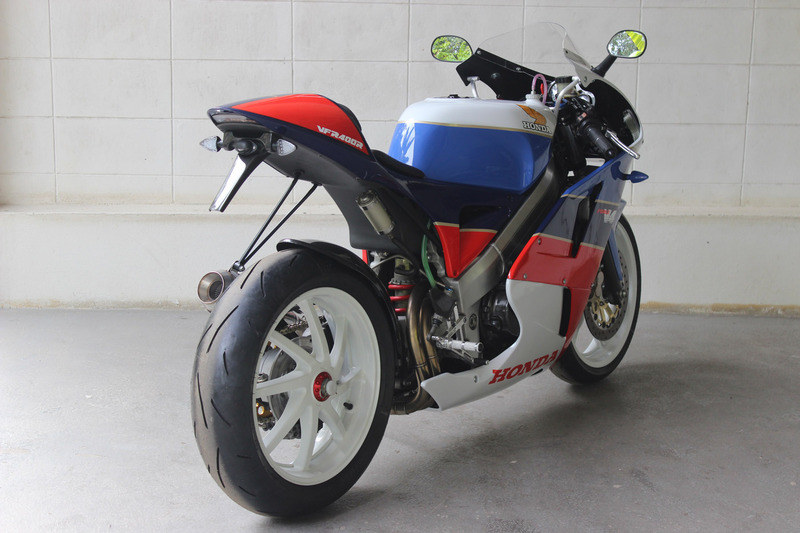 Those familiar with the NC30, will note that the suspension and chassis is pretty much stock. 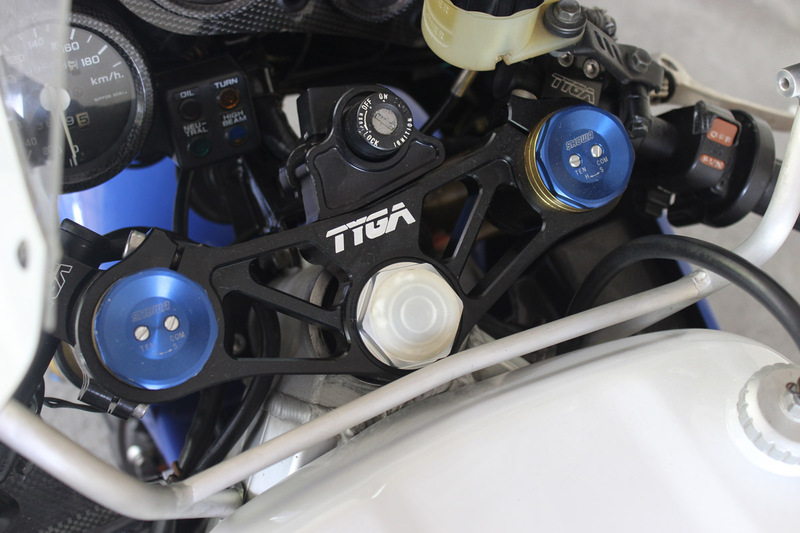 The front forks are held in place by a stock lower and a TYGA upper triple and the forks have TYGA preload adjusters installed to allow for a more sporty set up. We will also be offering a upper/lower triple clamp which will replace the heavy cast lower and steel shaft with CNC machined lightweight ones. We do have a plan to change the suspension at a later date. 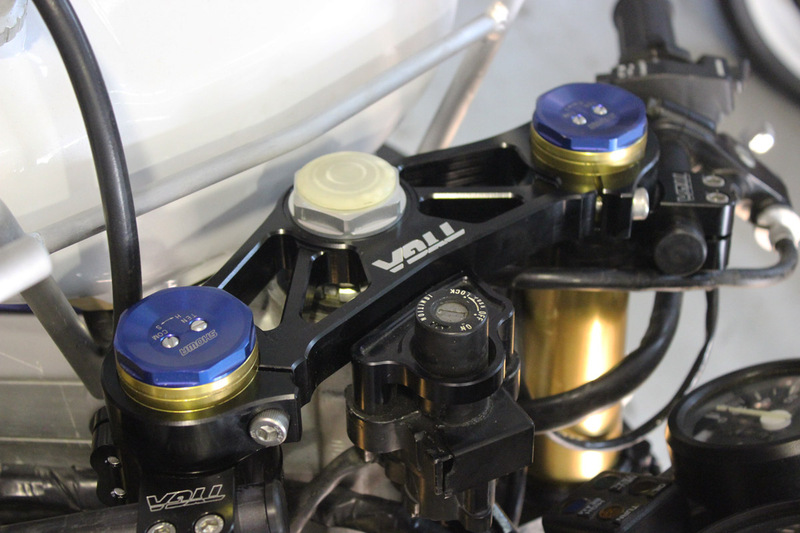 We are looking into a custom Ohlins rear shock as well installing a CBR600RR front end held in place by specific TYGA triple clamps for this conversion which will be available for sale. 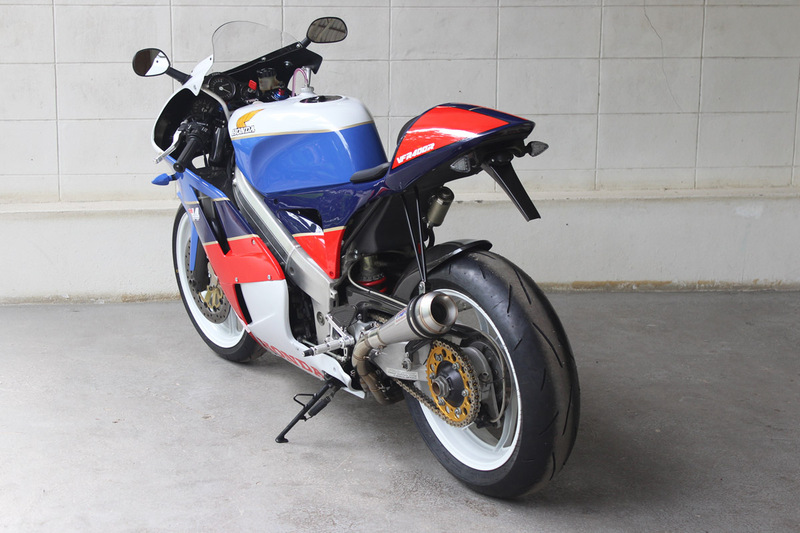 Front wheel is stock NC30 but the rear is an RVF400 17 x 4.5 inch hoop which is a direct replacement for the 18 inch one the bike was supplied with. 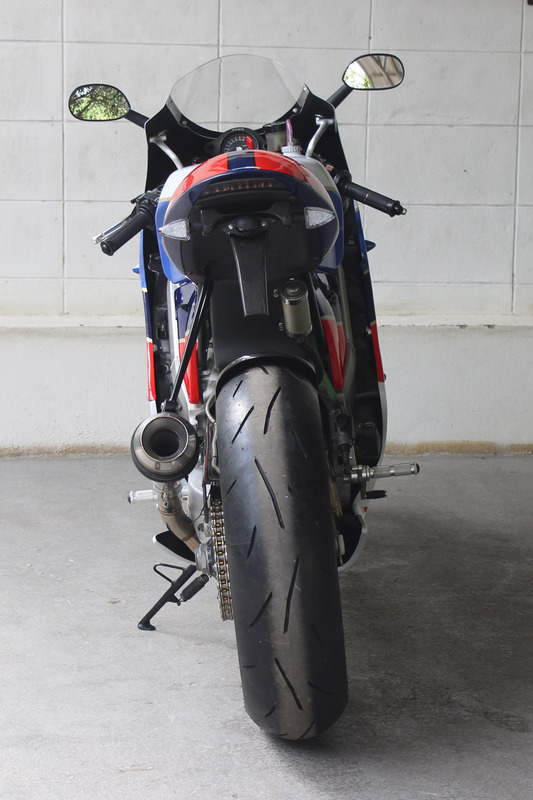 To give the bike a more aggressive stance, we have installed a wider 160 section tyre and a 2mm. wheel spacer to clear the chain. Using a narrower 520 section chain and a different brand of 160 tyre would probably allow fitment without a spacer but anyway, this was a quick and easy fix and similar spacers were used on many IOM racers back in the day, so why not? While we are talking about chains etc, the rear 43T sprocket is of course a TYGA one and is available in a range of sizes as well as 525 and 520 widths. Braking is by means of a stock master with TYGA lever working with stock 1989 type gold calipers. The discs are 296 mm. Sunstar and are direct replacement and they work as well as they look. 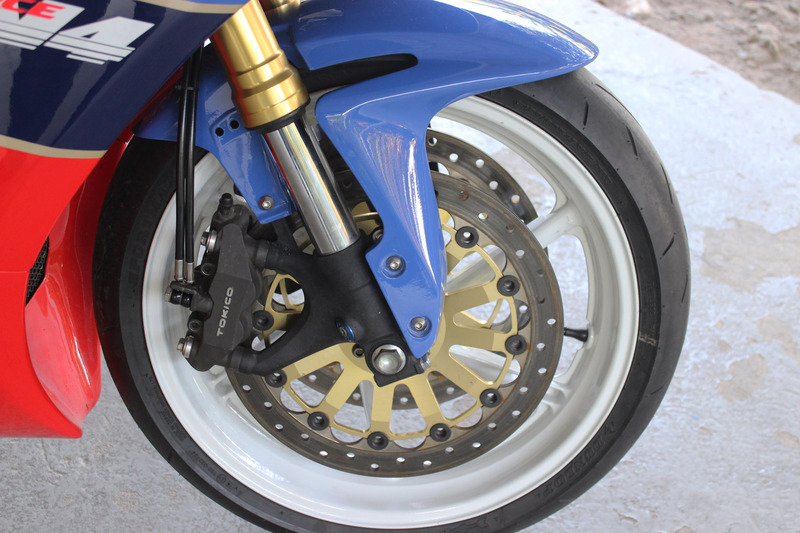 Rear braking is stock, though one day, we will make a Brembo caliper hanger; this is in the plan. Concerning power, the engine is stock though the power output is significantly increased by means of the TYGA exhaust and carbon air box. The carbs have been re jetted to suit and the throttle response is crisp and power increase is immediately noticeable when riding. 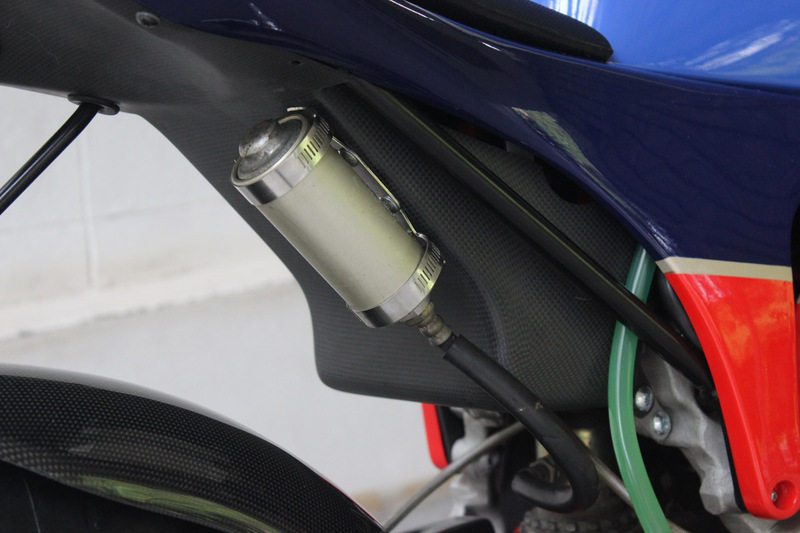 The exhaust is fitted with the infamous Moto Maggot so the sound is more MotoGP than the Honda whirr which is all you get from the stock system. Weight saving and looks add to the argument for installation of the TYGA system, though for the benefit of the neighbours, a more conventional silencer from our range may be more kind. 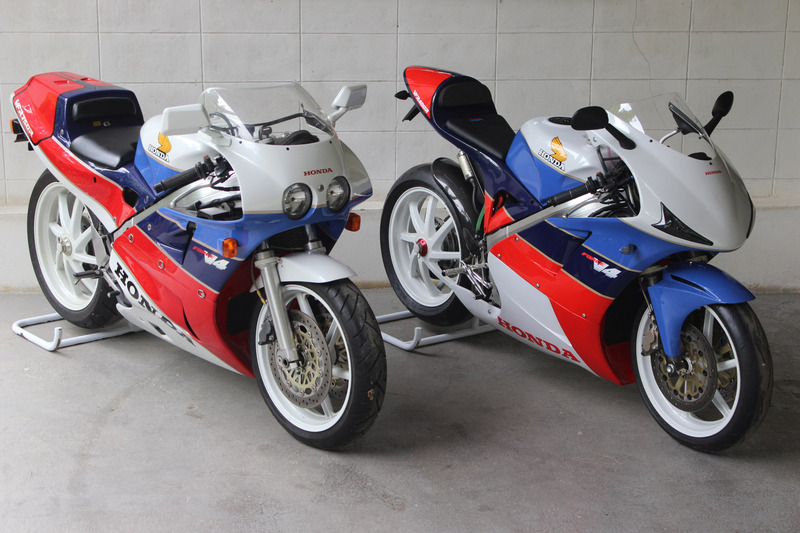 Ergonomics are one area which has really changed in the last three decades and our Project bike will not feel very familiar if you are used to the stock NC30. The seat position is somewhat higher and harder due to the GP-T seat cowling raising the rear end a few cms. 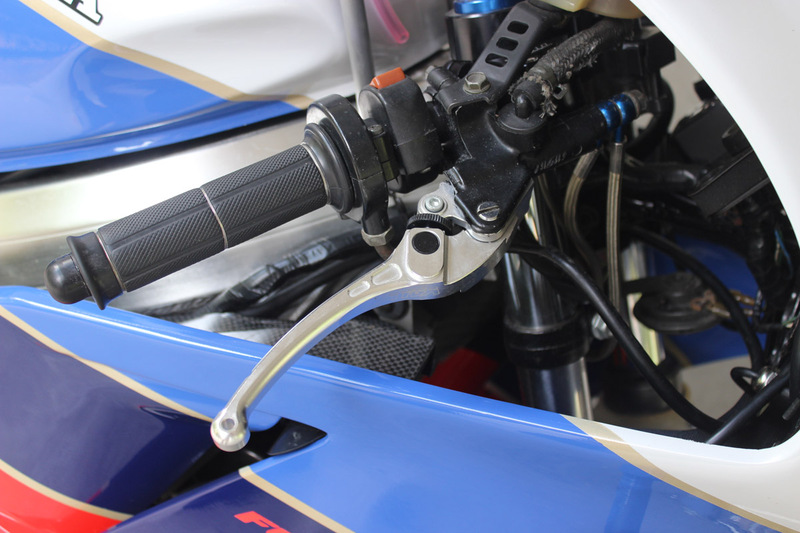 The foot pegs are also raised by means of the TYGA step kit so the rider is neither cramped nor dragging the pegs round the corners. The handle bars are TYGA and are in the stock positon but due to the rear being raised, makes the riding positon more modern and you are no longer sitting in the bike but on top with plenty of room to move around. 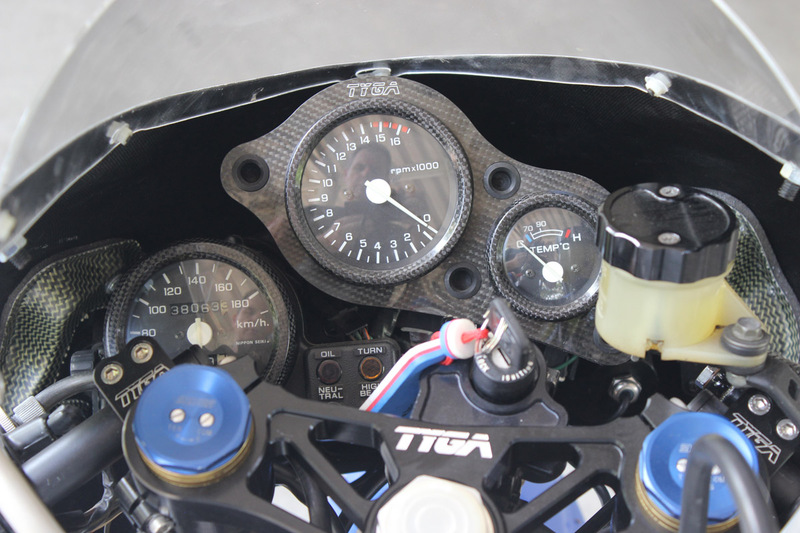 While sitting on the bike, you can also spot other TYGA components in the cockpit area such as the carbon frame in-fills, brake reservoir stay, instrument surround, kill switch cover and instrument bevel covers. Unfortunately, nearly every NC30 speedo has the clutch adjuster graze on it where the clearance on full steering has been insufficient. The carbon cover is a neat way to hide this scar while enhancing the sporting image. 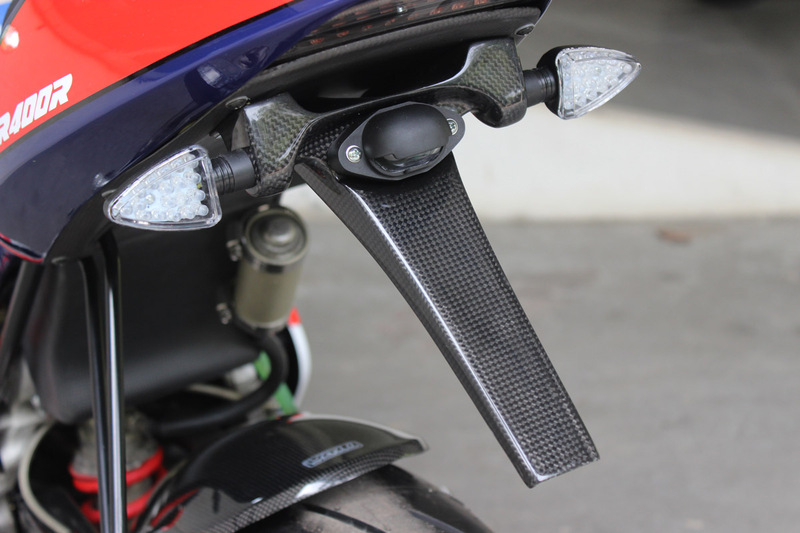 Referring back to the kill switch cover, this is something used in Moto2 to prevent accidental use in a race environment. Of course with our street bike, it is not strictly necessary but hey why not? 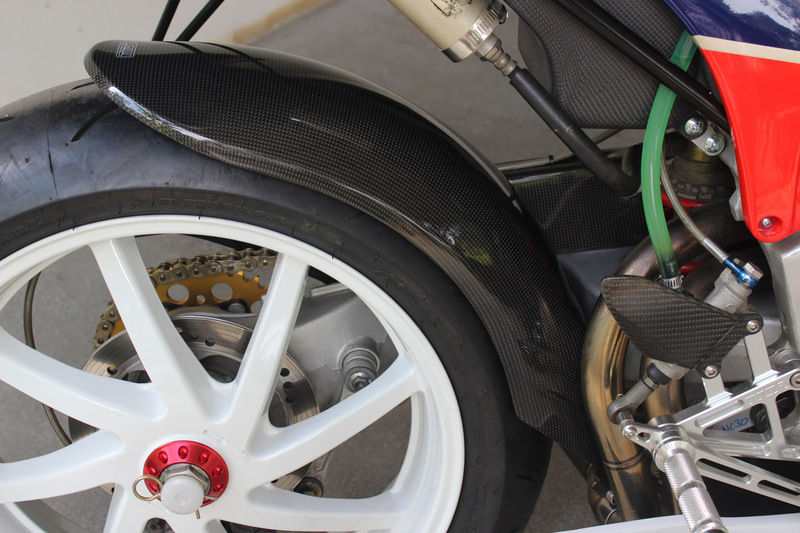 Another TYGA carbon component is the rear hugger which is actually an NC35 one (due to the NC35 wheel being used) and fits with careful adjustment. 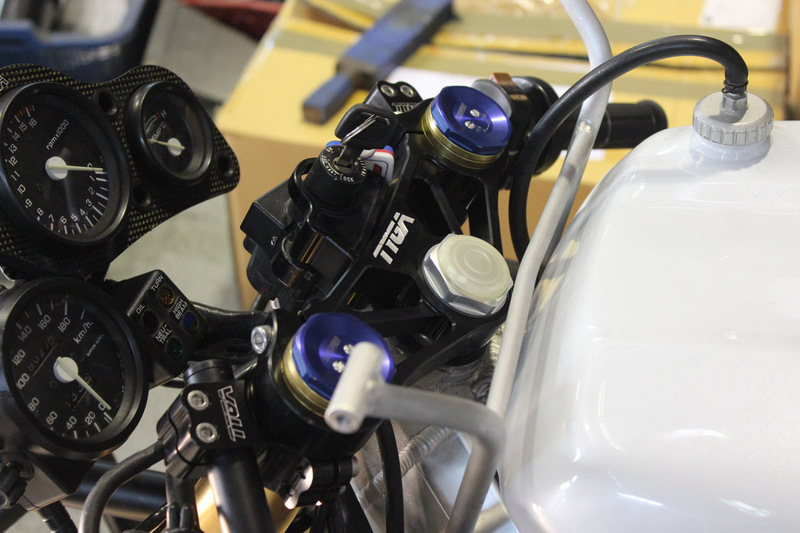 Other components to finish off the transformation are the keyless filler cap, engine armour, the blue rear wheel spacer and HRC pink tank breather hose. Riding the TYGA GP-T gives the best of both worlds, not only do you have the solid engineering and heritage of the NC30 V force power, but you also have increased power, eye catching style and modern ergonomics combined with the latest tyres and hopefully soon, suspension upgrades. 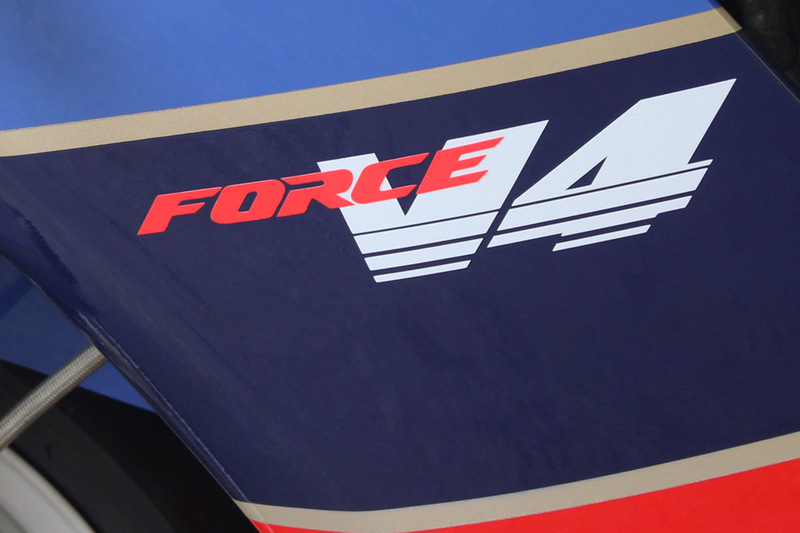 It all makes for an unbeatable sporting package which is unrivalled by the opposition, just like the RC30 did 3 decades ago; long live force V4! So, it wasn’t long before we decided to upgrade the front end on the NC30. The existing one was definitely letting the overall package down. 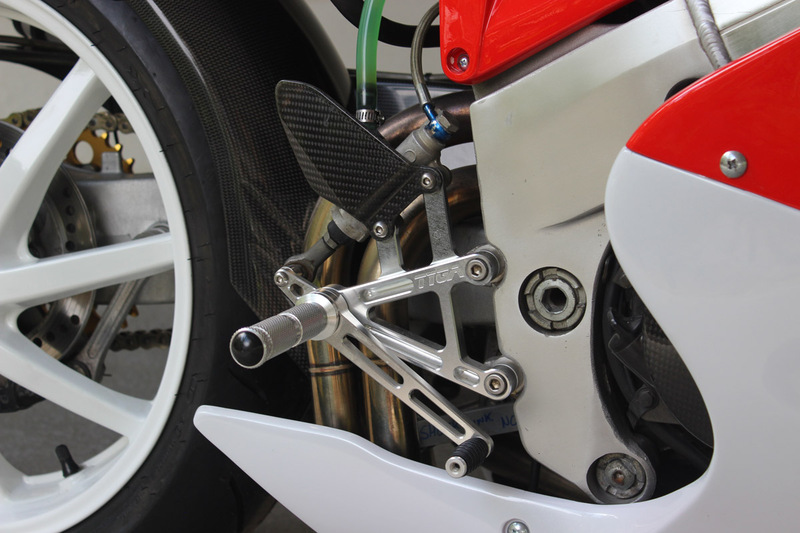 It didn’t take much to find a set of the latest CBR600RR front forks on ebay and with our new triple clamp conversion kit, it was a good opportunity to showcase the modification. 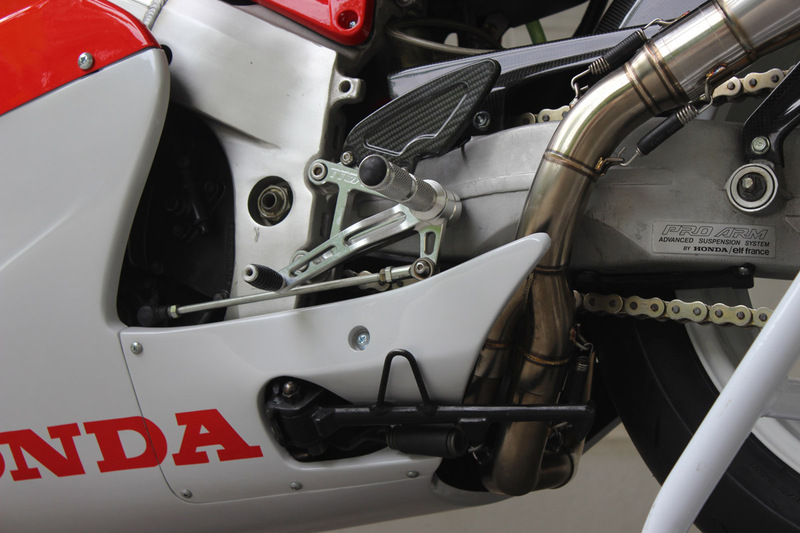 The forks actually use the same size wheel shaft as the older Hondas such as the NC30 and NSR250 etc. which was handy so we didn’t need to make any special bushes to put in the fork legs which is what we had to do with the MC28 with its earlier 600 front end. That was the good news. All we needed were some regular bushes to suit the NC30 and the wheel fitted no problem at all. What we did find which wasn’t an issue with the earlier 600 forks, was that the offset from one rotor to the other had changed which wasn’t such good news! Anyway, we installed some 320 Brembos with a 7mm offset and some GSX-R Tokico calipers with cut down mounts to get the correct position. 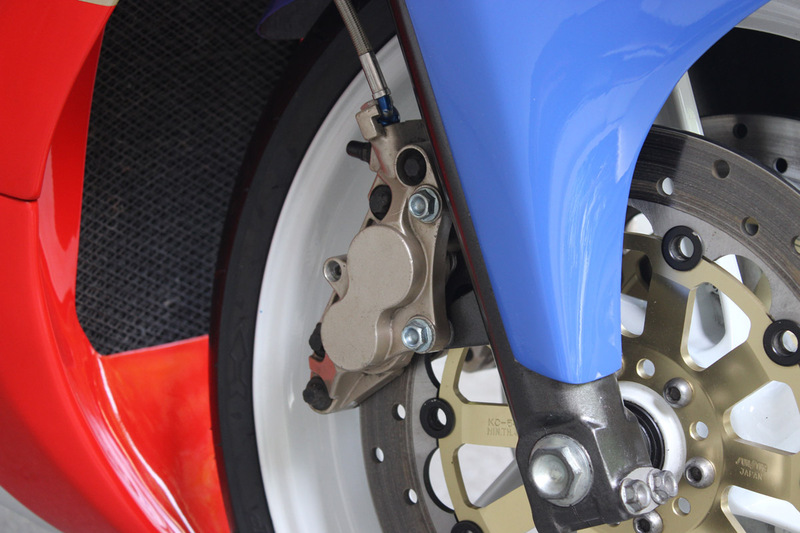 There are other solutions (such as the stock 600 calipers, wheel and rotor which will be a direct fit obviously). However, we like a challenge and used the parts we have at hand and got everything to line up. 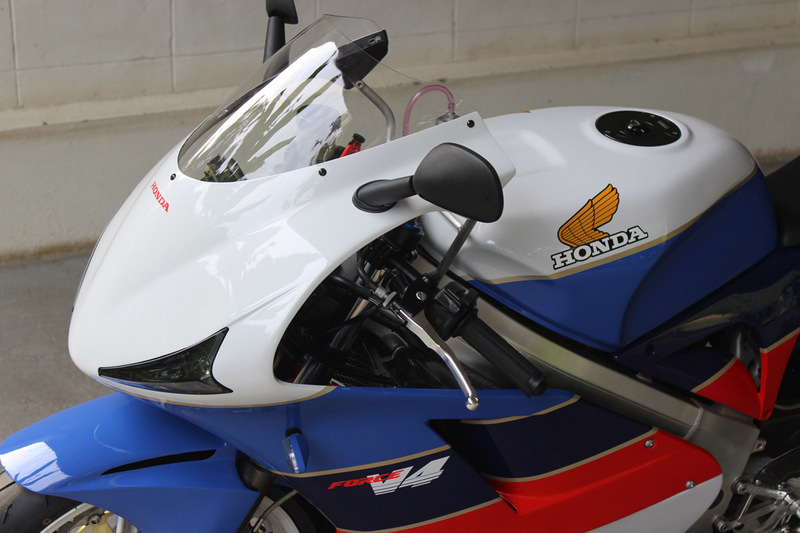 Next issue was the front fender which sits too high for the low profile tyre. We made some stays to lower the front mounts and modified the rear part of the fender to align with the mounting holes so now the fender is sitting lower down closer to the tyre. Perfect. We strung up some braided lines to suit the radial calipers and the stock master cylinder. 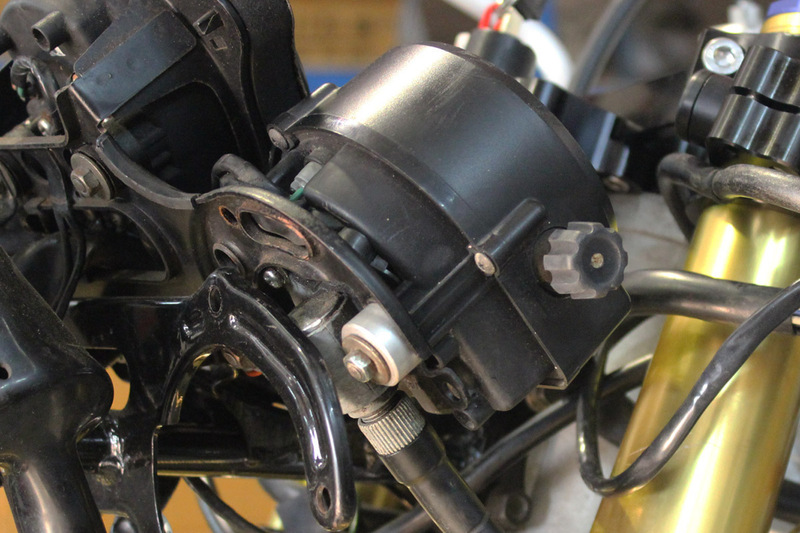 Frankly, we were concerned that the stock master might not be up to the job because it felt a bit wooden with the stock brakes and front end but we were also worried about space with a radial mount master so gave the stock 14mm NC30 master another chance. We needn’t have worried. It is very easy to dial in just the right amount of braking with this set up. The other thing we changed, along with the forks, were the handlebars for some of our 48 mm. type. 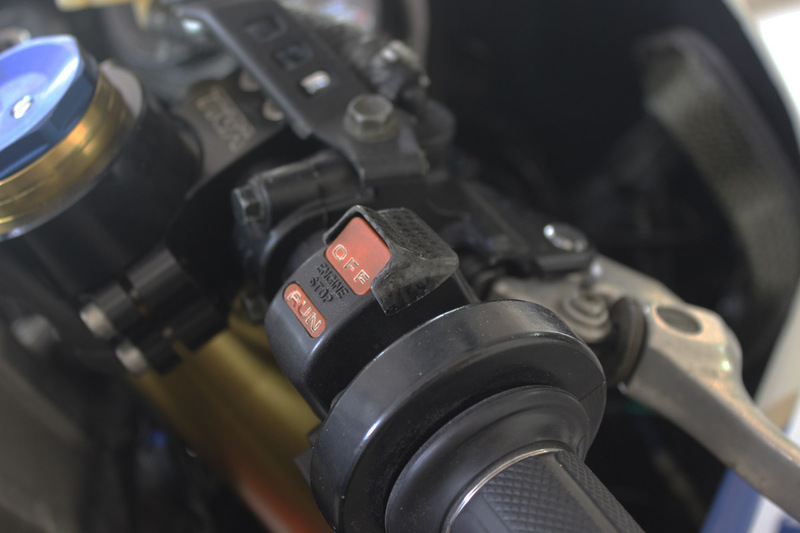 We noticed that even with a stock front end, Honda didn’t really allow enough space for the clutch cable adjuster to clear the speedometer on full steering and they mount it at a high angle which is not very sporty and actually quite irritating. Things were only going to be worse with a front end in terms of clearance, so we had a look for a solution. In typical Honda over engineering, the speedometer sits on nice fat rubber mounts so we decided to remove them. This gave us around 6 mm extra clearance. We had to put a bush behind the speedo mounts to tighten it up against the main instrument stay, but apart from that, it looks totally stock and you’d never know if I hadn’t told you! 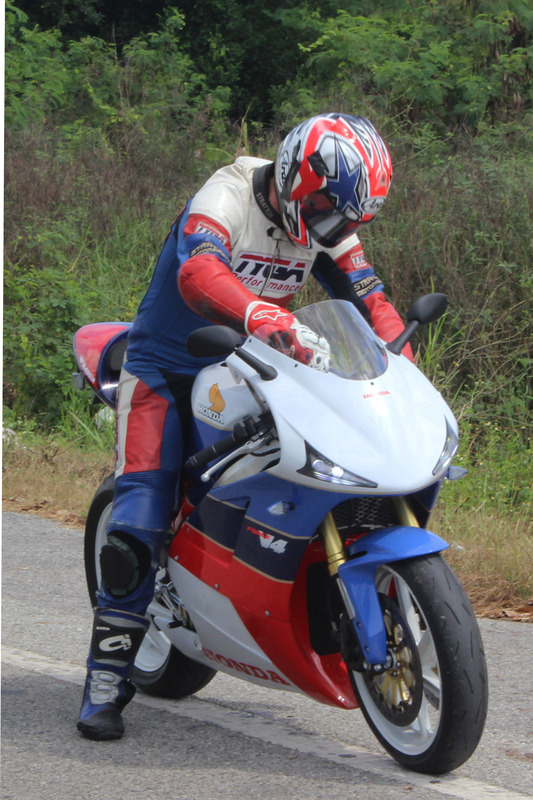 So now, with everything all tightened up and the fairing put back on, it was time for a test ride. Well, there really is no comparison. 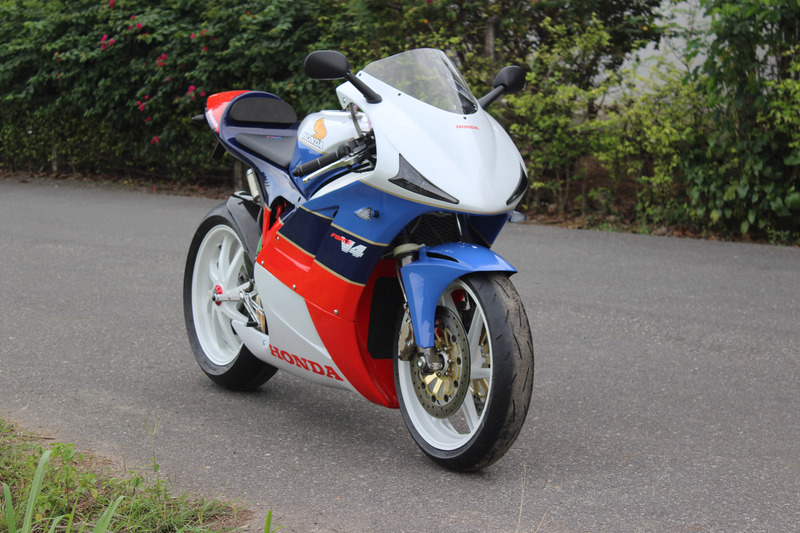 Just for the enhanced braking it transforms the bike and then you have the added bonus of 25 year newer suspension which is definitely noticeable. The front end is quite firm but it is all relative and our goal was to make a more sporty and focused bike and this we have accomplished. As we often say, these projects are never finished and we still have the rear suspension to sort out so I’d better leave a space below just in case!